Spider veins are red/purple fine lines, “starburst” clusters, or a web-like maze, near the surface of the skin, smaller than 1 millimeter in diameter. Varicose veins are enlarged, swollen, bulging, often twisted rope-like veins that occur on the surface of the legs and thighs. 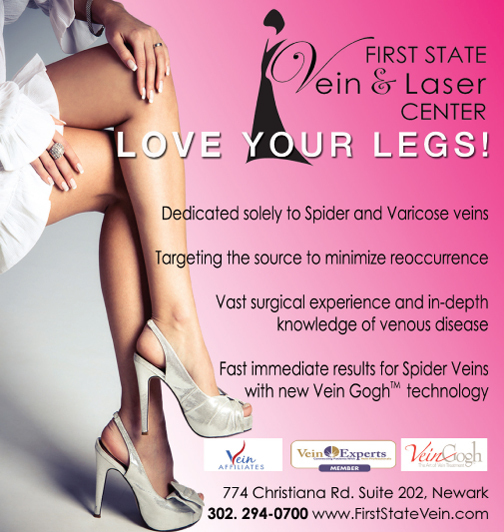 Why We Get Varicose and Spider Veins? All veins contain delicate leaflet-like valves that keep the blood flowing towards the heart and prevent it from flowing back towards the legs. When these valves fail, blood flows backwards, accumulates under pressure and enlarges them to become varicose veins. The high pressure within varicose veins can result in flow abnormalities within the tiny veins that lie very close to the surface of the skin, manifested as spider veins. How We Treat Spider Veins? Spider veins are not only a cosmetic problem. They are the visible manifestation of abnormalities in underlying veins, the reticular veins, which collect the blood from the skin and empty into larger deeper veins. To insure that spider veins do not re-occur after treatment, the abnormal reticular veins must also be treated. In First State Vein, patients are thoroughly evaluated to identify the reticular veins including ultrasound examination. Spider veins are treated by a pain-free injection of a solution (sclerosant) which causes the veins to seal and fade (sclerotherapy). In First State Vein we use a sclerosant that contains Novocain (a local anesthetic) to minimize feeling of discomfort. We also treat the underlying feeder, the reticular veins by sclerotherapy similar to the one used for spider veins, or by a delicate procedure aimed to remove these veins, called mini-phlebectomy, which is done in the office by a certified surgeon. How We Treat Varicose Veins? Guided by the duplex ultrasound examination, the leaky abnormal veins are obliterated and sealed by heat emitted from a very thin laser fiber inserted through a needle, (Endo-luminal Laser Vein Ablation) Local anesthesia insures that the procedure is pain-free. The bulging, varicose veins that remain visible are removed through a few small needle holes by the Mini-phlebectomy procedure. Q: If I Get Rid of Spider Veins, Will They Return? A: The therapy treats current spider veins, but does not prevent new ones from occurring over time. Treatment of the underlying feeding reticular veins will significantly decrease the chance of developing new spider veins. Q: Will medical insurance pay for treatment of varicose and spider veins? A: Medical insurance carriers, including Medicare, cover treatment of symptomatic varicose or spider veins, but NOT for pure cosmetic reasons. Q:When Can I Resume Normal Activities and Exercise? A:There is no down time and patients are encouraged to resume normal activities, except for heavy lifting, as they walk out of the office. My experience with Dr. Shapira and his staff at First State Vein and Laser Center was excellent. After one procedure I am pleased to see and feel a significant improvement in my leg. It is apparent that Dr. Shapira is a very talented physician. He takes the time to not only treat the problem, but also the time to find its’ cause and correct it. I would recommend him highly to anyone who suffers from varicose veins. – Janice P.
Nadiv Shapira, MD, FACS, FACPh, an adult cardiac and thoracic surgeon for over 20 years in the Christiana Care Health System, DE recognized the need for improvement in the care of venous disease. He recently established First State Vein and Laser Center, utilizing minimally invasive treatment modalities for all forms of venous diseases, including spider veins, large and small varicose veins, leg swelling and skin ulcerations. He is a diplomat of the American Boards of Surgery and Thoracic Surgery, fellow in the American College of Surgeons, the Society for Thoracic Surgery and the American College of Phlebology. He is a member of Vein Affiliates and Vein Experts. ← Previous Story The Time Has Come.